Seeing God in the Big Bang? 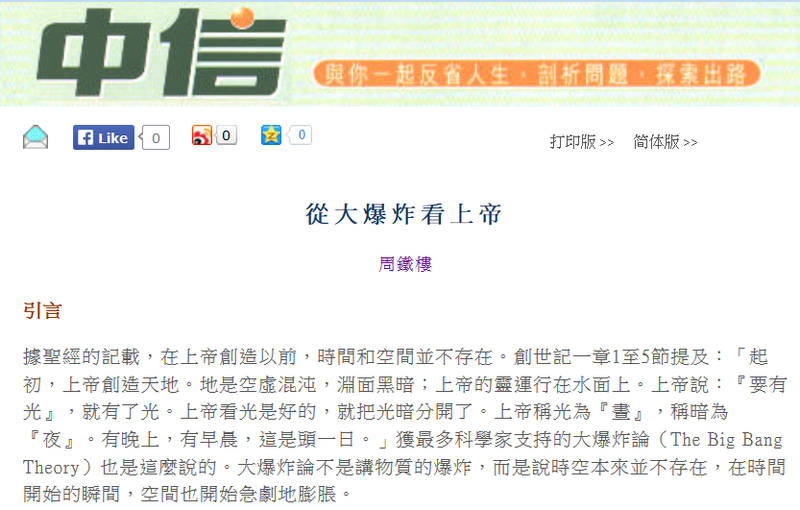 Here I review an article originally published in “Chinese Today.” The English translation of the article appears below with my comments (in brown) interspersed. The Big Band Theory, which is supported by most scientists, says the same. JGH: No it does not. That is simply false. The sequence in Genesis 1 is totally different to the BB sequence of events. The Big Bang is not talking about the explosion of matter, but space-time, which did not exist by itself; but at the moment of the beginning of time, space also began to expand rapidly. JGH: No claim should ever be tested based on the majority opinion. Many times the majority have been wrong. Take phlogiston for example. Right now on Earth the majority are wrong. Most scientists believe (note ‘believe’) in evolution, but they are wrong about it being real science and true. It is a godless belief system. So is the Big Bang. Big Bang Creation (ie. God used the BB) is an oxymoron. God did not use such a process. The Genesis 1 account in no way describes the BB, neither in sequence, timing nor action. To say so is blatantly ignoring the text. What Nachmanides described was an expanding universe with evolving matters. JGH: But contrary to the Genesis account. None of the scriptures that describe God spreading out the starry sky can be understood to mean cosmological expansion. The plain reading of the Hebrew or even in the English translation does not say that. This is basically the same as the modern theory of the Big Bang. After great many observations of the expanding universe, scientists found that the Big Bang Theory was its best explanation. JGH: This statement is dishonest. Astronomers do not observe an expanding universe—they observe redshifted light from galaxies. The idea of an expanding universe is an interpretation of that observation. You then need to show what causes redshift to conclude expansion. It is possible of course but it is dishonest to say expansion is observed, especially when it is not believed to be a Doppler effect. Secondly the modern BB model uses many fudge factors to justify the observations. Nachmanides lived in the years without modern scientific knowledge; yet he could explain the creation by God so much advanced of his time; it is amazing! It must be a divine revelation. JGH: How could it be a divine revelation and be so contrary to the order and detail in the Genesis 1 account? There are at least 37 contradictions in sequence of events between the BB scenario and the the 6 days of creation from Genesis 1. God created the universe and everything in it, and founded the natural laws by which all things operate. Scientists are not creators; they are only exploring and discovering the natural laws which the Creator founded. Therefore scientific discoveries should agree with the natural laws God set up. The Natural Revelation from God can be obtained through scientific discoveries. JGH: This is false. Scientific discoveries have a priori underlying assumptions by which the evidence is interpreted and ‘discoveries’ made. Hence the science is not neutral and must always be interpreted. The scientist’s worldview impacts how he interprets the data and therefore the meaning of the discovery. Therefore science can discover truth about God’s universe (the cosmos) only if the assumption is made that the Bible is true. The reverse is false. Scientific discovery cannot establish the truth apart from a belief in the authority of the Bible in all matters of science and history. Even natural law is subject to this. Repeatable scientific laws are subject to the belief from the Bible that the laws of nature are stationary because God is constant and does not change. This is what allowed science to develop in the West under a Christian culture. And to impose the principles of repeatable experimental science on the cosmos is a grave error, since one cannot do experiments on or interact with the universe. The revelation from the Scripture is a Special Revelation, made clear by the Holy Spirit and theological enlightenment. These two revelations help one another, and help us to know God and His creation. JGH: These statements sound like those from Dr Hugh Ross and his Reasons to Believe ministry. They lead to a rejection of God’s Word. Only by first accepting the Bible as the sole authority can one judge past events and the origin of the universe and all it contains. Otherwise you will have to accept man’s fallible opinion over the Word of God and man has rejected the truth of God’s Word. When we talk about cosmological issues, the objects of the subject are not the stars (e.g. the Sun) or the planets (e.g. the Earth, Mars and Jupiter etc. ), but the galaxies. Stars do not exist alone in the starry space; they form galaxies due to gravity. JGH: Galaxies forming from gravity alone is deceptive. Enormous amounts of unseen ‘dark matter’ are needed in all computer simulations to form both stars and galaxies. ‘Dark matter’ has just the right properties to overcome the problems. There are otherwise no known laws of physics that will allow stars and galaxies to form (apart from using a nearby supernova to compress the gas cloud, but that doesn’t solve the problem for the first stars anyway). Dark matter is the Big Bang believer’s ‘god of the gaps’ invoked to solve all sorts of intractable problems. There are big or small galaxies. The large ones contain 1011 stars; the smaller one have millions or tens of millions of stars. The radius of a galaxy is about several [JGH: tens to a hundred thousand] light years (one light year is the distance light travels in a year’s time [JGH: at constant speed 300,000 km/sec. The assumption is time flows at the same rate through the whole universe as it does/did on Earth, which may not be the case. This is a consequence of Einstein’s general relativity theory]). From the time of Isaac Newton, all people think that the universe was eternal and unchanging. Albert Einstein founded the Theory of General Relativity (TGR) in 1916; and the next year he discovered from calculations by TGR that the universe was not constant, eternal and unchanging, and keeps on expanding or contracting. JGH: No, he discovered from his mathematics, his general field equations, a model to describe a universe that was static, and to make it static he used the ‘cosmological constant.’ This is just mathematics, not somehow necessarily a description of the real universe. But in order to agree with the popular belief in the steady-state universe, he introduced a “universal constant,” to cancel out the possibility of and expanding or contracting universe. In 1922, Russian physicist and mathematician Alexander Friedmann also found by TGR that the universe was expanding. JGH: He discovered a different solution to Einstein’s field equations that described an expanding universe. This is just mathematics, not somehow necessarily a description of the real universe. JGH: Einstein’s model was static; you can hardly say he discovered the expanding universe of Friedmann and Lemaitre. Friedmann, and other researchers, was verified by astro-optical observations. JGH: No, impossible. Observations alone can never verify anything. They can only strengthen or weaken a model. But in the cosmos it is particularly difficult because we cannot carry out an experiment on the universe like we can in a lab. Light is the visible portion of the electromagnetic waves (EMW). EMW is like regular matter (such as water wave or sound wave), can be measured by wavelength (λ), frequency (ν), and wave speed (v). The relationship between the three qualities of waves are v = λ ν. In the 1920s, when observing the light spectra of [JGH: clusters of] galaxies, astronomers discovered a peculiar phenomenon: The families of spectra all moved a certain amount to the red end. JGH: Some also have blue shifted spectra. In order to understand the meaning of the phenomenon, we must first understand the Doppler’s Effect (DE). JGH: No cosmologist today believes it is a Doppler effect. If cosmological expansion, then it must be due to space expanding and the galaxies standing still in the space as it expands. But this cannot be empirically proven to occur at all. There have been suggested as many as 50 different mechanisms that might account for redshift and they might apply in different circumstances. The Doppler effect is only one of these. DE tells us that the frequency of all waves (sound or light) are related with the speed of the source of the wave. When the source is departing from the observer, the frequency lowers (and the wavelength lengthens). On the contrary, when the source is moving towards the observer, the frequency increases and the wavelength shortens. This effect is familiar to us by daily experience. For example, when we listen to the sound of the engine of moving vehicles; if it comes toward us, the tone rises; and if it leaves us, the tone lowers. The police use the principle of DE to measure the speed of the cars by the reflection of the radio wave pulse from the cars. Similarly, when the light sources in the galaxies are leaving us, the light we receive would has lower frequencies; that means a red-shift in its spectrum; but if the galaxies are coming towards us, the spectrum would have a blue-shift. JGH: The jump from the second last to last sentence is problematic as discussed above. In 1924, American astronomer Edwin Hubble spent several years analyzing the relationship between the distances of the galaxies with their spectra. At that time, most people believed that the motions of the stars must be quite chaotic, and predicted that red-shifts would be about the same as the blue-shifts. But amazingly, Hubble found that all galaxies are red-shifting [JGH: No he also found some with blueshifts]. They are all moving away from us. More amazingly, according to the report by Hubble in 1929, even the amounts of the red-shifts are not disordered; they are proportional to the distances the galaxies are from us: The further the galaxy is, the faster it is leaving us (this is the Hubble’s Law). As shown in Chart 1, Hubble proved that the universe is expanding. The discovery of the expanding universe is one of the greatest discoveries of the twentieth century. JGH: But is it expanding? The 2011 Nobel prize was given to the accelerating universe so it must be true, eh? Read the two part analysis of the evidence here and here. It also proved that the universe has a beginning as Genesis said. JGH: It does not prove an origin as described in Genesis even if you did establish expansion. No one has observed the origin of the universe which would be at infinite redshift in an expanding universe—hence unobservable. This seems to be a case of the author imposing his beliefs on the observations. If we reverse the time on the galaxies moving away from us, yesterday’s universe should have been smaller [JH: not correct, it should be ‘denser,’ that is quite different] than today’s, and the galaxies should have been closer. Therefore, in the distant past, the universe must be in a Singular State, with very dense matter and energy; the density could be higher than our imagination, maybe infinity; the space-time should be also collapsed, so that all physical laws cannot be applied. This kind of state of being is called the Singular State. Inspire by this idea, Belgian Catholic priest and physicist George Lemaitre and Russian-American physicist George Gamow made a proposal that the structure of space and time was generated from this Singular State. British astronomer Sir Fred Hoyle, in a radio broadcast on BBC in March 1949, called the proposal or model by Lemaitre etc as “the view of the Big- Bang;” and since then the term stuck to the Big Bang Model (BBM) as it became popularly known. Till today, this name still gives the false impression to people, as if that the Big Bang was like an exploding bomb, with shrapnel flying to all directions. This is not what the BBM is saying. What BBM says is: In the beginning of time, space expanded rapidly, energy appeared as space is expanding. JGH: Where did energy come from if universe came from nothing? Is this the only thing God did? A deist’s god. Energy was converted into all kinds of microscopic particles and anti-particles, …. JGH: What happened to all the anti-particles; where are they? Big problem, since the universe should be equally balanced between matter and anti-matter. … such as quarks, elections, neutrons, protons, unknown microscopic particles and anti-particles. This conversion from energy into particles is according to Einstein’s conversion formula between energy and matter: E = m c2 (Energy = Matter × Speed of Light squared). Once the particles and the anti-particles appear, they collide with each other and convert into one another. The whole initial universe was in a state of thermodynamic equilibrium. The galaxies leaving us is not the result of their motion in space, but due to the expansion of the space between us and the galaxies. JGH: As I said before, not the Doppler effect, and now you admit it. You can’t have both. Doppler effect means the sources move through space. It is not the same as cosmological expansion. And there is no laboratory evidence for it. It may be correct but it may not. This make cosmology at best a weak science. Really it is not even science, but philosophy. As shown in Chart 2: a big balloon is being blown bigger. A two-dimensional man on the surface of the sphere will find that every point is leaving him. The distance between every point is increasing, but there is no center of expansion. Similarly to the balloon, the universe’s expansion does not have a center, and there is no boundary. The universe is a self-contained holistic entity. JGH: No, the balloon is a “self-contained holistic entity”. To prove this is a description of the universe you would have to be God. The model you describe here is a finite universe, but most scientists now (since 1998 anyway) believe in an open infinite universe. Please get it right! JGH: Not correct. This scripture means creation ‘ex nihilo’ = out of nothing, which is not even energy. Only the true Creator can create ex nihilo. He did not need energy to create. He created out of nothing. There was no space, no time, no energy, no matter, nothing. The Bible did not tell us how energy turned into matter. God lets modern physics answer the question. JGH: Not correct. God clearly tells us in the Days of Genesis 1 what He did and the sequence of events, which does not match the BB sequence of events at all. The process of energy turning into matter is complex, and can be calculated briefly by the Uncertainty Principle in Quantum Mechanics, and the Energy-Matter Conversion Formula according Albert Einstein. I will not repeat it here. The readers who are interested can read my book.4 We will only do a simple conceptual introduction here. By theoretically estimation, 10-41 seconds after the beginning of time, the temperature was higher than 1011 K; the temperature is higher than our imagination. For example: after 10-6 seconds, the temperature was still as high as 1013 K. At this time protons and anti-protons already appeared. They collide with each other and became a pair of photons; and the photons will collide and become a proton and an anti-proton. This process can appear up to billions of times in a second, but each reaction is balanced by a counter reaction. Scientists can model the process after the Big Bag of the universe from 10-43 seconds till now. JGH: Scientists can model mathematics. To say the model applies to the real universe you would have to somehow test it on the real universe, which of course is blatantly absurd. The paragraph above describes a process that is pure speculation and can never be tested. To say otherwise is preposterous. JGH: Yes, because it never happened. It is pure speculation designed to eliminate God, the God of Creation, because man will then have to yield to their Creator and obey His laws. …we believe that God is the designer of the Big Bang of the universe. The divinely designed Big Bang of the universe is like a very complex super computer program: Once commissioned, it will use all the subroutines, ring by ring, layer by layer, develop infinite amounts of changes, including the rapid-expansion, the generation of the supernovae, the formation of new galaxies, the death of the old stars, the gravitational collapse into White Dwarves, the Neutron Stars, the Black Holes, etc. The evolution of the universe is completely under the control of a God-designed program. JGH: The truth is God created the laws of physics which tell us that the universe described in this article could never happen by just those laws. To start with stars and galaxies would never form, and a universe without them would look pretty empty. To make the standard BB theory fit the observations they have had to invent fanciful stuff called dark energy, dark matter, inflation and CMB radiation as the afterglow of the Big Bang. All these are unknowns invented to describe unknown phenomena in the cosmos. Even expansion of space is an unknown in the laboratory—it has never been observed in the lab. We hope that after reading this short article, you can say loudly: “Worthy are You, our Lord and our God, to receive glory and honor and power; for You created all things, and because of Your will they existed, and were created” (Rev 4:11 NAU). JGH: God deserves all the glory and honor from His created beings giving Him honor by believing exactly what He said in His word and not distorting it. The author became a born-again Christian in 1955, during his study at National Taiwan University. After earning a Ph.D. in 1969, he taught physics in California State University Stanislaus, Modesto, and was the chairman of the Physics Department for 18 years. He lived in Los Angeles after retirement, and is devoted to work for the mutual understanding of science and Christianity. (English translation by the introduction of the author on the magazine/website). NAU = New American Update = New America Standard Bible (NASB) 1995 Updated Version. Nachmanides, Commentary on the Torah, ed. C. Chavel (Jerusalem: Rav Kock Institute, 1958 Hebrew, 1971 English trans.). (The English text here is translated back into English from the Chinese translation). 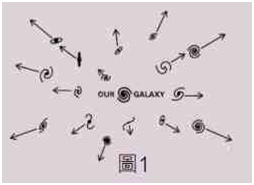 Chow, Tai L., Gravity, Black Hole, and the Very Early Universe (New York: Springer, 2008). Did God use a big bang?